How to assess the impact of research is of growing interest to funders, policy makers and researchers mainly to understand the value of investments and to increase accountability. Broadly speaking the term "research impact" refers to the contribution of research activities to achieve desired societal outcomes. The aim of this overview is to identify the most common approaches to research impact assessment, categories of impact and their respective indicators. We systematically searched the relevant literature (PubMed, The Cochrane Library (1990-2009)) and funding agency websites. We included systematic reviews, theoretical and methodological papers, and empirical case-studies on how to evaluate research impact. We qualitatively summarised the included reports, as well the conceptual frameworks. 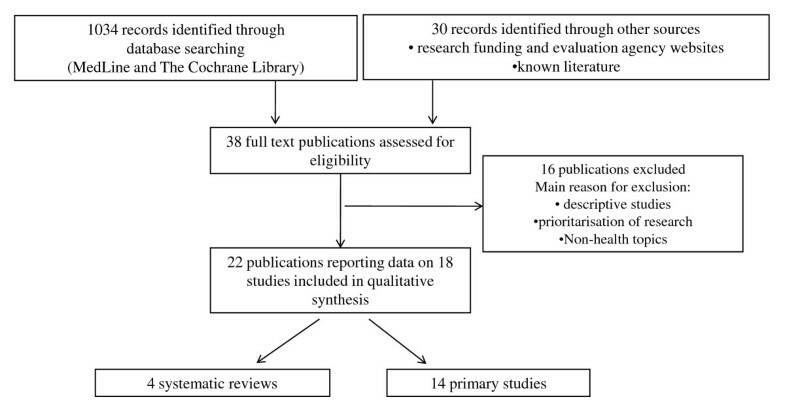 We identified twenty-two reports belonging to four systematic reviews and 14 primary studies. These publications reported several theoretical frameworks and methodological approaches (bibliometrics, econometrics, ad hoc case studies). The "payback model" emerged as the most frequently used. Five broad categories of impact were identified: a) advancing knowledge, b) capacity building, c) informing decision-making, d) health benefits, e) broad socio-economic benefits. For each proposed category of impact we summarized a set of indicators whose pros and cons are presented and briefly discussed. This overview is a comprehensive, yet descriptive, contribution to summarize the conceptual framework and taxonomy of an heterogeneous and evolving area of research. A shared and comprehensive conceptual framework does not seem to be available yet and its single components (epidemiologic, economic, and social) are often valued differently in different models. It is widely accepted that research is a crucial investment to foster innovation, knowledge advancement, and social and economic development. For example a knowledge gain is assumed to result from biomedical and basic research; if such an output is then properly translated in a short but reasonable time lag, it will lead to a better health status for populations and patients. Much of the information produced is not easily transferable to patient care and this has led to the concept of the so called "translational blocks" . Evidence produced by applied types of health research, such as the "comparative effectiveness" and "health services research" elicits its potential impact in a more straightforward way. Health care systems, which are nowadays increasingly keen to directly support research, are interested in overcoming the translational blocks and to facilitate a quicker return of their investment in terms of information that would help selecting the more effective and cost effective interventions so that quality and appropriateness can be maximised [2–4]. By definition, research activities are risky and their returns highly unpredictable. So, any attempt to increase the research system's effectiveness, and to assure and monitor quality, is welcome by the whole scientific community and funders . Competition on limited resources and different funding modalities also raise additional concerns. From the limited available evidence on the proportion of investments by research stream, funding is skewed toward biomedical and basic research which, by definition, require more time to have an impact . This has raised a debate between those who ask for a priority-setting based on the ability to produce relevant, usable, and transferable outputs and those supporting the view that research should be driven only by the researchers' interest. If left only into the close boundaries of the "research communities", there is a concrete risk that the priority setting becomes self-referent and the "bidirectional dialogue" between those that generate relevant questions from observation in clinical practice and those that are responsible to generate the new knowledge remains very limited . Monitoring and measuring research impact is a complex objective requiring the involvement of many actors within the research pipeline. In the past two decades, many theoretical frameworks and methodological approaches to measure research impact and returns have been developed. The payback , the cost-benefit [9, 10], and the decision making impact models  are examples of evaluation approaches reported in scientific and health policy literature. A partial list with a qualitative description of the most common frameworks is reported in Table 1. All these models share a multidimensional approach achieved by categorizing impact and benefit in many dimensions and trying to integrate them . A set of indicators and metrics are then generally associated to each category of impact. For example, bibliometric indicators (e.g. impact factor) are highly reported as a measure of the diffusion and awareness of research results. These indicators, though welcome to some extent because of their directness, are at best only surrogate measures of impact. Moving toward more robust metrics, such as those measuring the health status or the economic benefit of a population, is a complex task but in some way essential . iii) other indicators (minimum 5%). The objective of this overview is to describe the conceptual and methodological approaches to evaluate the impact of biomedical and health research. Specifically, we aimed at collecting and qualitatively summarizing what is available in the biomedical literature in terms of theoretical framework and methodologies, with a specific focus on the most valid and reliable indicators of impact. Our objective was also to see whether this qualitative analysis would have allowed the identification of a preferred model to measure research impact and to identify the desirable elements (i.e. dimensions to be considered, robust and reliable indicators) that a reference model should have. Other key elements in the "research governance debate" such as the analysis of different modes and approaches to research funding, prioritization of topics, or the analysis of barriers and facilitators to the translation of research results were beyond the scope of this overview. In the context of this overview, the term "research impact" refers to any type of output of research activities which can be considered a "positive return" for the scientific community, health systems, patients, and the society in general. We refer to any type of health-related research, basic and biomedical, such as new drug or technology development - and applied research such as clinical trials, health service research, and health technology assessment (HTA). The complexity and heterogeneity of the topic made the conceptualization of this overview much less straightforward than typical review on medical interventions. We therefore followed the methodology recommended by the Cochrane Collaboration for preparing "overviews of review" rather than following the steps involved in critically appraising the primary studies for a systematic review (SR) . We first searched for SRs summarizing theoretical model or methodological approaches as well as empirical assessment of health research funding programs. To increase the comprehensiveness of our search we also sought primary studies (case studies) not included in the selected SRs or published in languages other than English. We included studies describing conceptual or methodological approaches to evaluate the impact of health research programs and the empirical evaluation of specific programs, funders, research teams, clinical area, etc. In both cases, to be eligible for this review the study should have mentioned specific impact categories and the indicators and metrics used to measure this impact. Given the broad perspective of the review, the methodology to identify relevant studies comprised an iterative process. We first performed a systematic search on bibliographic databases (Medline and The Cochrane Library) using a modified version of the search strategy proposed by Martin Buxton and collaborators . The search was limited to the SRs published between 1990 and 2009. We also tried to include relevant studies and reports not included in the eligible SRs (i.e. publications in French, Italian, and Spanish) published between 2007 and 2009. Besides bibliographic databases, we screened the research funding and Charity's Foundations websites cited in the eligible studies, looking for the grey literature (i.e. additional reports not indexed in bibliographic databases). In fact, a large part of the literature in this field would be made up of heterogeneous publications and critical appraisal reports published by the main funding agencies. Details on the search strategies used and the searched websites are reported in Additional file 1. Finally, we screened the citations reported in the included publications and assessed the literature in the field already retrieved by authors. We did not contact study or report authors. Two reviewers independently selected relevant publications by screening titles and abstracts. After the retrieval of the selected full text publications and, if needed, of associated publications, we extracted the following details: objective, country and setting, evaluation time lag, conceptual model methodology, main results and conclusions. From the analysis of the literature and with reference to the more widely accepted theoretical models we attempted a description of the categories of impact more frequently measured, focusing on the indicators and metrics for each category. Given the heterogeneity of study designs, the different objectives and the lack of a standard methodology between studies, we did not perform a quality assessment of the methods used in different studies. From the bibliographic databases and web searches we identified 1064 records. Among these 38 potentially relevant publications were retrieved as full text (Figure 1). Sixteen publications were excluded, i.e. because descriptive,  or dealing with prioritization of research topics rather than impact [16, 17]. We included 22 publications, referring to 18 studies: four SRs [12, 18–21] and 14 primary studies [8, 9, 22–36]. For each study, we synthesized the overall objective, scientific area evaluated, country and setting, and the time lag of the evaluation. Flow of studies through the different phases of the overview. Hereafter we briefly presents the four SRs. For details please refer to Additional file 2. The included SRs presented and discussed comparative analyses of theoretical models and empirical evaluations performed in several countries from 1990. They all used a public funder's viewpoint (e.g. central or regional governments, WHO). Besides the evaluation of specific research programs, each SR also reported a description of theoretical models used as a framework for the assessment and a more or less explicit description of categories of impact and indicators used in the evaluation. Both the reviews by Hanney et al and the one from the Canadian Academy of Health Science answered to the broad question "how to measure research impact". The first aimed at assessing how the impact of the UK National Health Service Health Technology Assessment program should be measured and collected the available models, their strengths and weaknesses . The latter was interested in defining the impact of the Canadian health research and to answer to the broad questions "is there a best method to evaluate the impacts of health research in Canada?" and "are there best metrics that could be used to assess those impacts?" . These SRs included studies aimed at describing conceptual or methodological approaches to evaluate the impact of health research programs as well as empirical applications of different assessment strategies (desk analysis, interview, peer-review evaluation, case-studies, etc.) and tools for measuring impact (indicators and metrics). The review published by Buxton et al in 2004 focused on the estimation of the economic value of research to society. The review reported an analysis of benefits in terms of direct cost savings to the healthcare system, commercial development, healthy workforce, and intrinsic value to society due to the health gain . Lastly, Coryn et al. have reported a comparative analysis of 16 national models and mechanisms used to evaluate research and allocate research funding . Hereafter we briefly presents the results of the included primary studies. For details please refer to Additional file 3. The studies covered a broad range of evaluation exercises sponsored by public and private research funding agencies. All studies have been conducted in UK, Australia, Canada, and USA, with few exceptions [26, 32]. These studies were highly heterogeneous in terms of the applied theoretical frameworks and methodology. The unit under evaluation included researchers (from one single researcher to teams and whole institutions) but also medical discipline (e.g. cardiovascular disease research) or type of grants (e.g. from public institutions, charities, foundations, etc.). The large majority applied a bottom-up evaluation approach, where information goes from any "producers" of research to any target of research outputs . Two studies applied a more strictly econometric approach used to estimate return on investments in a top down manner [9, 36]. The method often used were the desk analysis, peer reviewer evaluation, interviews and questionnaires to principal investigators or to stakeholders with a variety of roles in the research production and utilization. Across the majority of the SRs and primary studies, research impact was assessed alongside several dimensions, which can be grouped into five categories: "advancing knowledge", "capacity building", "informing decision-making", "health benefits", and "broad socio-economic benefits". Each category, further split into subcategories, had a set of indicators and metrics capable of providing the size of the impact (see Table 2). The more frequently quoted dimensions of impact were advancing knowledge (using bibliometric and citational approaches), capacity building (mainly using a desk analysis approach), and informing decision-making (through the evaluation of how and to what extent research findings are included into the decisional processes, i.e. guidelines). The potential benefits of a research activity on population's health or its socio-economic status were more rarely addressed by the literature as they are, obviously, less directly linked and more complex to assess. In other words, these categories, with their respective indicators, span into a gradient going from surrogate but easy to be measured outcomes, (i.e. bibliometric and citational data) to demanding but relevant outcomes (i.e. morbidity, quality of life). Bibliometric indicators (number of publications, impact factor, citation indexes, etc.) were a case in point here. They were widely considered, reported, and to some extent, accepted due to the fact that they are easy to measure and outputs that can be straightforwardly attributed to a specific research activity. Only the studies adopting an econometric viewpoint  or evaluating a specific research area, such as primary care [27, 28] or health system effectiveness  did not quote (or quoted with less emphasis) bibliometric indicators. • Other possible indicators (expanded relative citation impact, relative download rate). Bibliometric and citational analysis; desk analysis. Basic, clinical, applied and social research. Assessment of individual researchers, teams, institution, projects, funding agencies. -robust only if based on a sufficient set of publications (not fully appropriate to individual researcher evaluation). Assessment of teams, institution, projects, funding agencies. Not recommended at individual level. This overview of reviews shows that the assessment of the impact of, or benefits from, health research is an issue of growing interest, mainly in those countries (UK, Canada, Australia, USA) that invest more in research. Research in this area focuses on three broad areas: i) theoretical frameworks and models aiming at assessing research impact with respect to multidimensional and integrated categories; ii) methodological approaches to the evaluation exercise; and iii) development of valid and reliable indicators and metrics. A common and key feature of most of the used models is the multidimensional conceptualization and categorization of research impact. Different impact aspects are connected and integrated using a variety of theoretical approaches (i.e. Logic model for the Payback framework). Assessment of research impact that consider more than one category are indeed valued for their ability to capture multifaceted processes. Several empirical approaches have been used to practically assess research impact: desk analysis, including bibliometrics, peer reviews, interviews, ad hoc case studies. The latter seems a reliable methodology: case study implies an explicit and a priori choice to start and conduct an evaluation exercise with specific aims and features. However, they can be at risk of "conceptualization bias" and "reporting bias" especially when they are designed or carried out retrospectively. Finally, feasibility and costs of case studies are also a major barrier to their conduct and subsequent use. In general, the methodology should be as flexible and adaptable as possible to many assessment questions, viewpoints, settings, and type of research and should guarantee the quality of collected data. The lack of standard terminology, the multifaceted nature of the evaluation, and the heterogeneity of the empirical experiences make it hard to identify a preferred model. The most cited impact dimensions are related to knowledge, public health and socio-economic advancements. The Payback model, [38–41] and its adaptation into the Canadian framework  emerged as the most frequently quoted. Both are based on explicit assumptions (positive and negative), have been applied to empirical evaluation, and produce transparent categories of impact, indicators, and limitations of the models. They can be considered comprehensive as assure a global approach to the evaluation of biomedical and health research impact. The identification of appropriate indicators is a critical step in any impact assessment exercise, and assessing research impact makes no exception to this. Indicators can be defined as factors or variables that provide simple and reliable means to measure impact, changes to an intervention, or performance . Ideally, a set of a few robust, valid, shared, transferable, comparable, and feasible indicators able to synthesize research impact should be developed for any assessment. As a matter of fact, the usefulness of indicators highly depends on the evaluation purposes and the level of aggregation of the unit of analysis: for instance, citation indicators partially capture the impact on knowledge advancements as they only consider published literature, they are artificially skewed by journal's impact factor and can be misleading when applied to individuals. Moreover, an indicator itself informs only on a single aspect of research impact, thus sets of indicators are always advisable. This overview highlights the methodological limitations of the studies carried out in this field, which are briefly summarized below. First, the vast majority of the studies were retrospective, based on interviews to principal investigators or funders, and mainly focused to record the projects' achievements rather that their pitfalls and limitations. This could lead to several biases, such as selective recall or reporting of (positive) results. The second major limitation is linked to the "attribution", the possibility to postulate a causal link between observed (or expected to be observed) changes and a specific research activity . Another limitation is linked to the possibility of understanding what would have happened without "that" research activity (counterfactual). As very rarely a "control" situation is available, the identification of baseline measures and context factors is important in understanding what any counterfactual might have looked like. Finally, it is not commonly appreciated that substantial time lags exist between research funding and measurement of outputs. An impact assessment should be planned choosing an appropriate time window, which highly depends on the considered type of research and dimension of the impact. The main limitations of this overview concern the study retrieval process and the definition of the eligibility criteria. We experienced several difficulties in planning the search strategy, all caused by the heterogeneity of definition and the lack of a standard terminology to describe "research impact". Bearing this in mind, we adopted an approach capable of maximizing sensitivity rather than specificity, that is the application of broad inclusion criteria and the use of several sources of information, not only bibliographic databases. As expected, only 30% of the included publications were found through the traditional biomedical databases (i.e. Medline). Beyond a high variability in the way of indexing these articles, this could be due to a limited interest in the publication of these evaluations, which were considered, at least in the last decade, an administrative duty rather than a scientific activity. Thus many relevant studies were retrieved in the "grey literature" (i.e. funding agency's reports) and not in scientific journals. Even if we were not able to apply a systematic approach to website consultation, we believe this effort had increased the comprehensiveness of our search. Another methodological limitation of this overview is that we did not estimate the level of publication bias and selective publication in this field. Finally, as our analysis include study up to 2009, we did not capture new important emerging approaches to impact assessment, such as the Research Excellence Framework (formerly RAE) . The main message of this overview is that the evaluation of the research impact is as yet a heterogeneous, and evolving discipline. Multidimensional conceptual frameworks appear to be adequate as they take into account several aspects of impact and use advanced and analytical approaches (i.e. epidemiologic, economic, and social) to their evaluation. It remains to be clarified how different impact dimensions should be valued and balanced by assessors to fit them to their specific purposes and contexts. Added values to the multidimensional approach are to pursue an explicit planning of the assessment exercise and to carried out the alongside the development of research programs, through monitoring and prospective data collection. This overview should be seen as a preliminary step toward a shared conceptual framework and taxonomy to assess research impact rather than an indication of an ultimate model, that probably appears unrealistic. This overview was developed within the project "Research impact in Emilia Romagna: an open archive of health research outputs. Evaluation of research products and capacity building" funded by the Programma di Ricerca Regione Università 2007-2009, Regione Emilia Romagna, Italy. The funder had no role in study design, collection, analysis, interpretation of data, writing of the manuscript, and in the decision to submit the manuscript for publication. We acknowledge that this paper is a revised version of a first overview published in Italian in the journal "Politiche Sanitarie" (http://www.politichesanitarie.it, Banzi, R. Pistotti, V., Moja, L., Facchini A., Liberati A. Valutazione dell'impatto della ricerca biomedica e sanitaria: revisione sistematica di letteratura Politiche Sanitarie 2010, 11(3): 175-195). We thank Christine Kieran from the University of Modena and Reggio Emilia for the final editing of the manuscript and for editorial support. All authors were involved in the conception of the study. RB, LM, VP, and AL were responsible for the study design and acquisition, analysis, and interpretation of data. VP was responsible for the search strategy design and the study retrieval. All authors contributed to the preparation of the final text of the article, they critically revised it for important intellectual content and gave final approval to the manuscript.